It’s been a long winter. A long, long winter. Not necessarily from the weather-side, but just from the life side. But never fear – I’m still here! And finally back into a groove of cooking. I’ve noticed that the things I cook often reflect my mood. If I’m feeling good, my recipes turn out great…but if I have the blues, then my dishes just really, well, stink. Several weeks ago, this was made on a snowy Saturday night. We had no place to be, no plans to be had, so my husband and I made a date with our couch. It was definitely one of those nights where you wanted to just sit there, veg out, and watch TV. And, I confess, a night where you want to eat dinner on the couch. A perfect night for comfort food. I had all the ingredients on hand for this recipe and decided it would be the perfect night to try it. And boy oh boy, it was a winner. For the pasta, bring a pot of water to a boil. Add the pasta and a dash of salt and cook until al dente. As the pasta cooks, heat a nonstick skillet with the olive oil over medium-high heat. Add the beef and brown it, breaking it up into bite-size pieces as you go. Add in the onion, Worcestershire sauce, salt and pepper to the skillet to season the meat. As the meat and pasta cook, heat a saucepot over medium to medium-high heat. Add the butter and whisk in the flour as the butter melts, making a roux. If necessary, adjust heat to make sure the butter does not burn. Once the roux is nice and smooth, whisk in the stock and milk. Season the sauce with salt and pepper. Bring the sauce to a bubble, then thicken it up a few minutes. Keep an eye on the pot so that the mixture does not bubble over. Stir the mustard into the sauce, then add the cheese a few handfuls at a time to the pot. Stir the mixture well so that the cheese melts, but does not burn at the bottom. At this point, your meat and pasta should be done. Drain the pasta and add it back to hot pasta pot. Add the beef, then the cheese sauce to it. Stir to combine the mac ‘n cheese ‘n burger altogether. Taste and adjust the seasoning. Serve in shallow bowls with chopped pickles and tomatoes for garnish, if you’d like. I figure this can also work with turkey, chicken, or veggie burgers as well. Whatever your heart desires, I suppose 🙂 The only things I would not recommend adding are mayonnaise and lettuce – it would become very soggy, wilty, and just…ick. 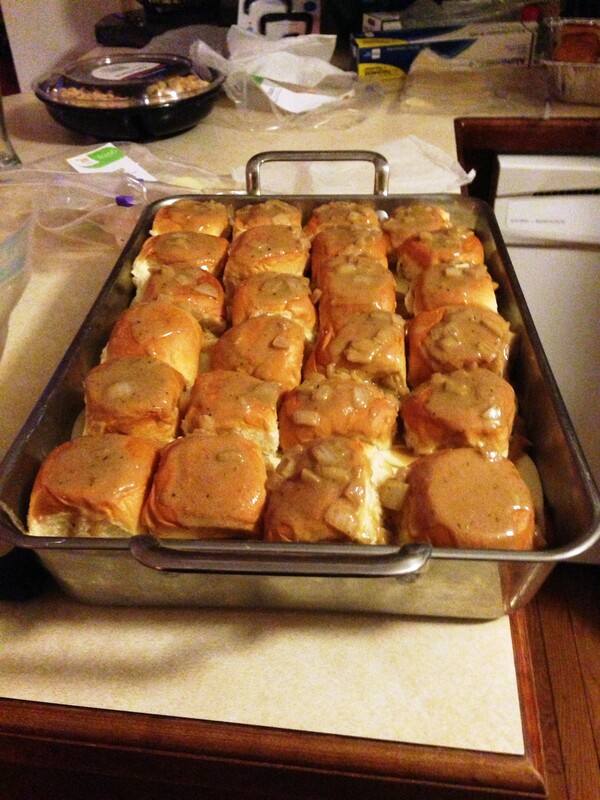 After writing this post I have to admit…I want to go make this again, right now. Yes, it’s that good! For the past month or so, I’ve had this tube of polenta sitting in my pantry. I like polenta a lot – and have seen quite a few recipes that include it – but just never got around to it. I really liked the idea of using it with a Mexican-flavored dish, so off to the internet I went. I came back with polenta tamale pie. Mike is a huge fan of tamales, so I figured this would be a great dish to try. There are so many recipes out there for this, so I ended up reading through a few and just going for it, so to speak – the two links I’ve linked to gave me the best directions based on what I had sitting in my pantry & freezer. In a skillet, heat the oil over medium heat and add the onion; cook for a few minutes until the onions start to get a little soft. Add the garlic and the ground beef at the same time – keep an eye on the garlic so that it doesn’t burn. Once the ground beef has been cooked through, turn off the heat and drain the mixture in a colander in the sink. In a bowl, mix the ground beef with the refried beans. Add the spcies and salsa, and mix to combine. In a baking dish, layer about half of the polenta rounds to cover the bottom. Then pour your beef & bean mixture on top of that. Lay the second half of the polenta rounds over the mixture, and cover with cheese. Cover and bake for 15 minutes. Remove the cover, and bake for 15 more minutes (a total of 30 minutes total). Serve with sour cream and cilantro, and a side of yellow rice, if desired. Sadly, I don’t have a picture of my tamale pie, because my husband someone had dug right into the pie before I could snap a picture…and this is one of those dishes that doesn’t look very appetizing once someone has started digging into it. But, you’re going to have to trust me on this one. It’s delicious! You can easily, easily make this a vegetarian (or maybe even vegan if you omit the cheese?) dish by making your mixture with corn, tomatoes, and pinto or black beans, instead of ground beef and refried beans. More than likely, this is what I’m going to do next time I make this dish. You really wouldn’t “miss” the meat, persay. You could even do ground turkey instead of beef, to lighten it up – I used beef because I have some in my freezer, and wanted to use some up before transferring it to the new chest freezer!!! So, in a nutshell, that’s what’s been up over here in my kitchen. Tamale pie, and a new freezer. All while it’s freezing cold outside. My husband & I are slowly working on eliminating processed foods and while this recipe does not help with that, it takes care of leftovers for you. And, for us, it created some leftovers that will be good for lunches the rest of the week. The best part of all? It’s fast. It’s easy. It tastes pretty good. In a skillet, cook the beef until browned. Add spices if desired. Drain and put back into the skillet. Turn the heat on to low, and add the soup & vegetable. Add at least 1/2 can of water to cut the sodium and keep the mixture from sticking. Unroll 1 tube of crescent roll dough and press into the bottom & sides of the pie plate. Make sure you seal the seams by pressing them together. Layer 1/2 of the beef mixture, and half of the cheese into the pie plate. Repeat. Place the second tube of crescent rolls, unrolled, over the filling and press the edges to seal, if desired. Bake for 15-20* until the crust is a nice golden brown. When I make this again, I plan to do it in the fall. I needed to (obviously) use my oven, and yesterday was a pretty warm day. I added the peas because I really wanted a vegetable in there. I chose cream of potato soup based on recipe reviews on the original website post. Eventually, I’d like to make my own cream-of-vegetable soup…but that’s another experiment for another day. 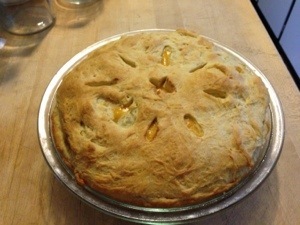 I was very pleased with how well the crescent rolls had made a crust for the pie. It held in the mixture very well and was really a quick and easy crust. I formed the crescent roll ‘crust’ on a cutting board by mushing the dough together and pressing it out with my hands – though I suppose Campbell’s method is easier, so that’s why I included it. I also made those pretty slits on the top crust with a knife – that was easy, too 🙂 Perfect for a busy Monday night! I’m always up for finding new ideas to work with ‘leftovers’ in my refrigerator. hopefully this one will help some of you out sometime – we host a few cookouts during the summer, and end up with leftover everything – including burgers. On a separate note…if it’s as sticky & humid by you as it is by us, stay cool and stay hydrated! One of the foods I’ve really had a taste for lately is a good old-fashioned cheeseburger. There are a few decent places to get a burger up by where I live, but nothing really beats one that you make on the grill during the summertime. It’s still winter up here, and it’s been pretty cold lately – so not the right weather for making burgers on the grill. I found this recipe from one of my favorite ‘healthier food’ blogs and knew that we just had to try it. With conferences & honors band last week, I didn’t have much time to cook. However, Hubs is now back on day shift…so he did the honors with this one. Set a medium sized pot of water on the stove to boil, and Preheat the oven to 350*. Spray a 9 x 13 inch baking dish with cooking spray. Once the pot is boiling, cook the pasta until al dente, and drain. In a large skillet, heat the oil over medium-low heat. Cook the onions until soft (about 5 minutes). Add the garlic & saute; once you can smell the garlic cooking, add the beef and cook until brown, seasoning with salt & pepper. Add the tomato paste, tomatoes, and mustard. Let simmer until it thickens. Remove from heat. 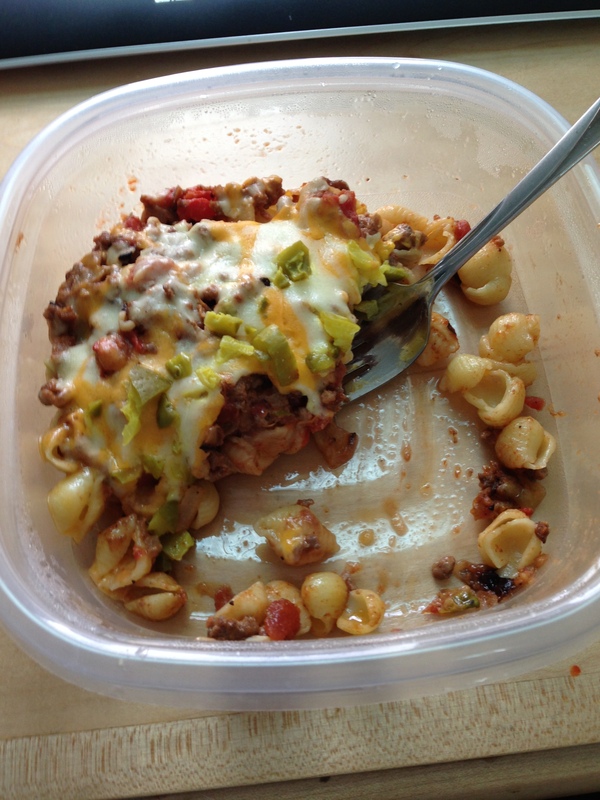 In a bowl, mix the cooked pasta in with the meat/tomato mixture, and pour into the baking dish. Top with cheese & bake 15-20 minutes, until the cheese is nice and gooey. Remove from oven & top with chopped pickles. Serve. Cheeseburger Casserole. The leftovers are just as delicious as the dish the night that it’s made (that is, if you end up with any leftovers). It was a delicious meal to come home to after conferences and it helped satisfy that taste I’ve got for a nice greasy cheeseburger. Since it’s still cold outside, casseroles are still more than welcome in my kitchen and this one did a great job of satisfying my taste buds as well as my need for comfort food. I highly recommend it! We had a very laid-back, quiet Christmas yesterday. Because of my husband’s work schedule, we were unable to travel down to Ohio to celebrate the holiday with our families. I will be traveling down tomorrow, a day late due to a blizzard – and thus Mike will be working and ‘baching it’ for a few days. Today will be spent cleaning up from the holiday, cooking lunches for Mike, and getting ready for my trip. When work schedules and/or weather hinder us from travel, we always make an effort to have an enjoyable day and a dinner that is ‘fancier’ than usual. Mike’s idea this year was Beef Wellington. I know that I for one had never had this dish before, and I’m not sure that he had, either. The verdict? YUM! It was a success. Including the usage of liver pate. As weird as it sounds, it really added something significant to the dish. I grew up eating gooseliver pate as a kid (my dad is German, don’t judge!) so I wasn’t really too freaked out about purchasing it from the butcher. We ate our beef wellington, made into two individual portions, as part of a surf & turf meal (lobster was our surf) with mashed potatoes and asparagus. 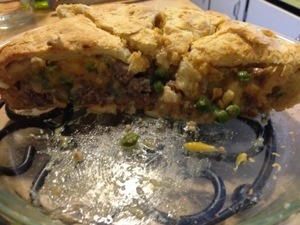 This was very filling, so we both saved half of our wellingtons for tonight’s dinner. Heat the butter in a medium skillet. Add shallots & garlic, and cook for about 30 seconds. Add the mushrooms, salt, & pepper, and cook until all the liquid evaporates and the mushrooms begin to carmelize. The consistency almost becomes paste-like. Add the wine & cook, deglazing the pan, until the liquid has evaporated. Remove from heat & cool before using. Preheat the oven to 425*. Line a baking sheet with parchment paper, or foil sprayed with cooking spray. Heat the oil in a medium skillet (I just used the same one that I made the mushrooms in). Season the filets with salt & pepper, and add to pan. Sear for 1 minute on each side, for a medium-rare beef. Remove from heat & set aside. Roll out the puff pastry on a lightly floured surface, so that from it you can get two pieces that will successfully over your pieces of beef. Spread half of the mushroom mixture onto the pastry, followed by a portion of the pate. Top with the filet. Using your fingers or a pastry brush, coat the inside edges of the puff pastry with egg wash. Then, fold the pastry edges over so that everything is encased by the puff pastry. Place the wellingtons seam-sides down onto the baking sheet, and brush with egg wash.
For medium-rare, bake for 20 minutes. Remove from oven, and let rest for 10 minutes before serving (this is a good time to finish preparing any sides). I forgot to take a picture – but cut in half, they’d look something like this! I am glad that we had made individual portions for this meal, so that we wouldn’t have a ton of leftovers, nor would we completely gorge ourselves during our Christmas meal. As I said before, we only made it through about half of our portions, since we had a few other things to eat with our meal. I plan on reheating this in the oven tonight, in a covered baking dish, so that it does not dry out. This dish is filling, and indulgent – a perfect main dish for a special occasion. 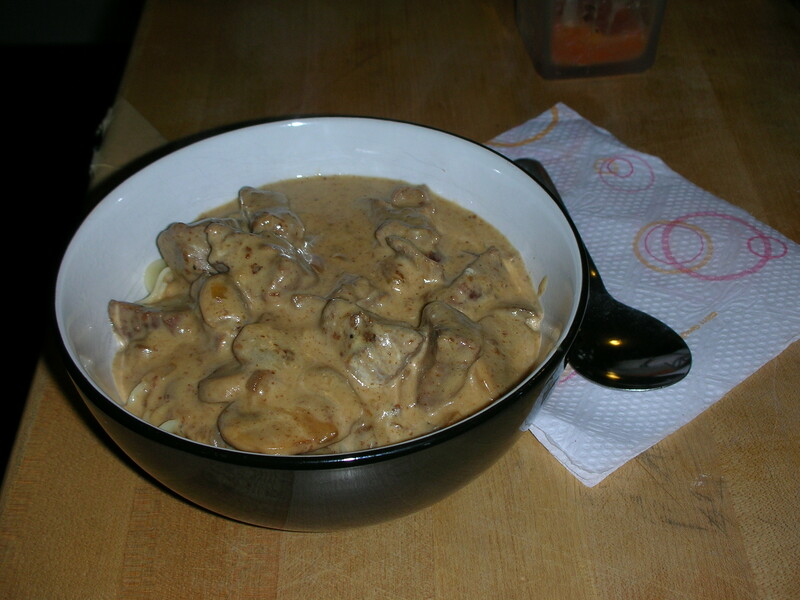 I have finally succeeded in finding a recipe for beef stroganoff, that is just, well, awesome. People have tried to make this dish ‘lighter’ – and so far the times that I’ve tried, it hasn’t been very impressive. Thus, my husband has asked a lot recently to throw the lighter versions of beef stroganoff to the wind, and just make a legitimate, stick-to-your-ribs version. Enter the Paula Deen recipe. And no, it doesn’t involve a whole stick of butter ;-)…it’s a cup of sour cream instead! Thus, I’m glad I walked downtown to the store today, instead of driving there! Sprinkle garlic powder, salt & pepper on meat, and dust with flour. In a large pan, add 1 tbsp oil and brown meat on both sides. Remove from pan & set aside. Add the onion & mushrooms to the pan, along with the rest of the oil, and butter. Saute until the onion is tender, and sprinkle with 1 tsp flour. Add the beef back to the pan & toss. Add the soup and beef broth. Stir to combine; cook over low heat for about 30 minutes, covered. Stir occasionally to make sure the mixture doesn’t stick to the bottom of the pan. Add salt & pepper when/if needed. Stir in the sour cream the last few minutes, right before serving. Serve over cooked egg noodles and peas. So delicious, it’s almost a tad sinful. I took one bite of this and sent a quick email to my husband – “Yum. I get it now.” Sometimes there’s nothing better than the real thing.